Have you been teaching your kids cursive? If you aren’t, you really should consider starting. I was terrified of the idea of teaching it back in the day, but now, I am a huge fan of teaching cursive early and letting your kids get started while they are still excited at the idea of fancy penmanship. 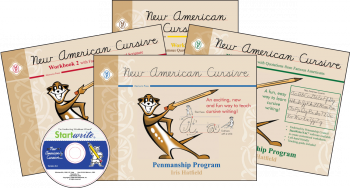 Memoria Press‘s New American Cursive: Penmanship Program is a great place to start. Workbook 1 can be used with children as young as first grade. Starting cursive young has a ton of benefits. It allows children to write easier and quicker because they don’t have to pick up their pencil between letters. It reduces reversals and misformed letters because the natural flow of the words keeps kids on track. Young children find cursive to be fun and you’ll have a lot less resistance from them by starting young. I started cursive with Bug when he was 7, and today, he can write fluently and neatly in cursive. Starting early worked really well for our family. I think had I waited until he was 9, I would have been met with a lot more resistance (gotta love nine-year-olds and their sense of independence!). Mr. Man is starting with this book now at 7, and I am hoping to have the same wonderful results from him in a couple years. New American Cursive features a letter style that is simple, and easy to master. The book has large lines, so your child will have plenty of room to practice their letters. The top binding makes it comfortable for left and right handed children to use. Your kids are going to love this program once they see the cute meerkat which guides the lessons, and the laid back, multi-sensory teaching method. You’ll be encouraged to trace the letters in the air or on the desk (or on a salt tray for a more sensory experience) before putting pencil to paper and practicing in the workbook. I love that this program can also be used with the StartWrite software, so once you get the basic instruction from the workbooks, you can continue to create copy work in the exact same style for practice. Ideally, this program should be used from first to third grade (or, more quickly if your child wants to work ahead!) and then you can reinforce with the software as needed.